Former Arsenal midfielder Jack Wilshere is “set to finalise” his transfer to West Ham, says the BBC. Wilshere’s move from Arsenal to West Ham is “set to be confirmed on Monday” says the Mirror. It is? The story of where Wilshere will resume his career is confusing. On June 15, the BBC said West Ham were only willing to offer Wilshere a one-year contract. Today’s Mirror says he will sign a three-year-deal worth £100,000 a week. On June 25, the Sun told us that Wilshere was in Turkey “finalising a move to Fenerbahce”. He wasn’t. 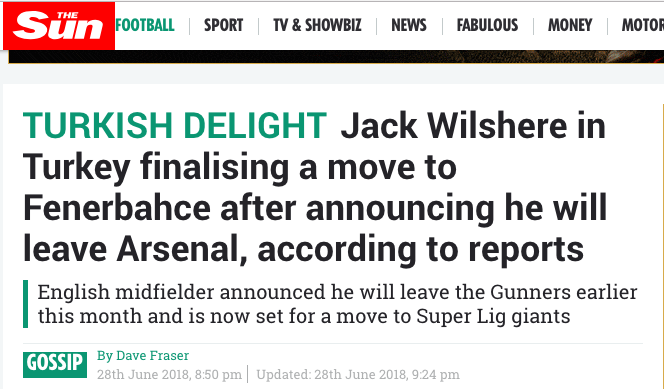 But on July 2, talksport said Wilshere was heading to Turkey – “according to Turkish journalist Volkan Demir, Wilshere has signed the contract and his switch will be announced on Monday“. The Express agreed: “JACK WILSHERE is set to join Fenerbahce after leaving Arsenal, according to transfer expert Volkan Demir.” Who is Demir? On twitter Demir has an incredible 49million followers. Disappointingly given his gargantuan following on twitter – he’s far less popular on Instagram – his tweets are not viral monsters. But if he says Wilshere is off to Fenerbahce, then the British Press are not ones to argue.